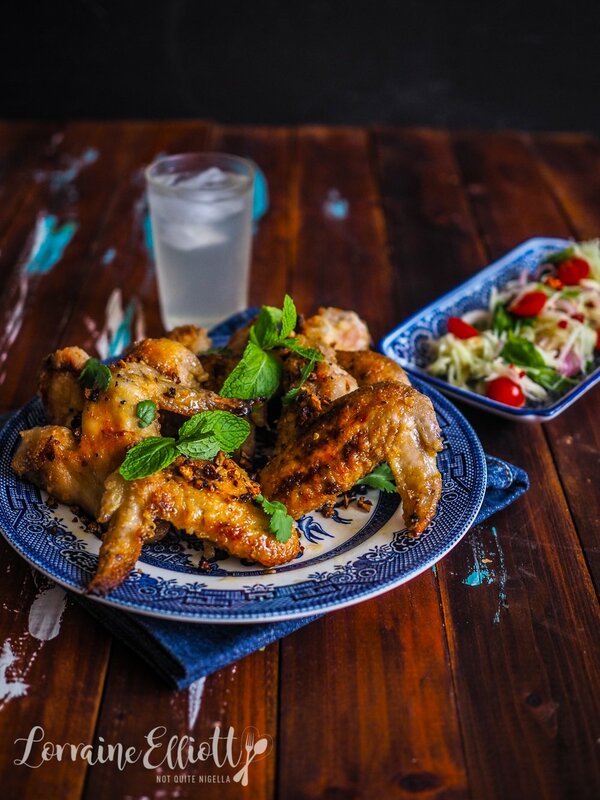 The Famous Pok Pok Chicken Wings! 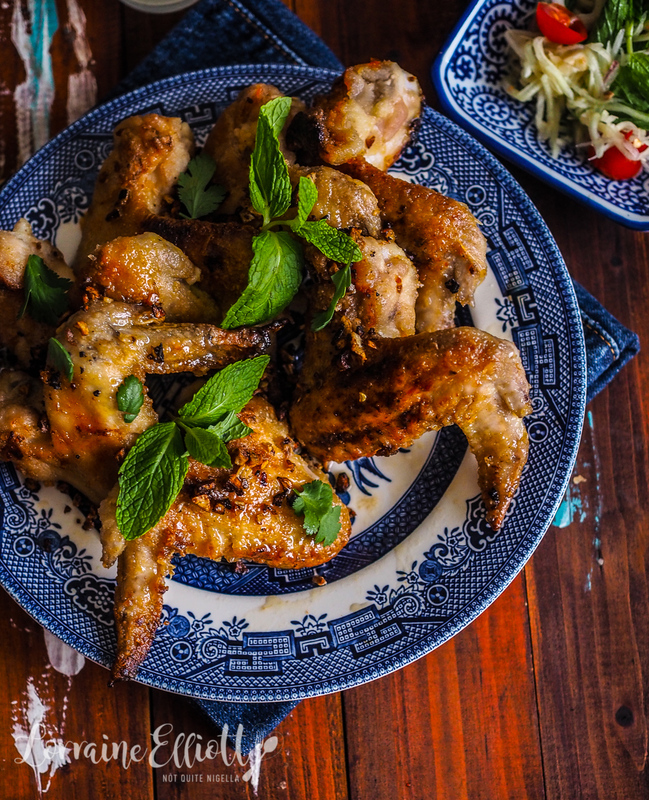 If you've ever visited Portland, chances are you may have tried the famous Pok Pok chicken wings or at least heard about them. They're a deep fried chicken wings marinated in a sweet fish sauce caramel. They're addictively sweet and salty with a chilli punch that makes them so moreish. And better still you can absolutely bake these in the oven to keep them nice and moist inside too! 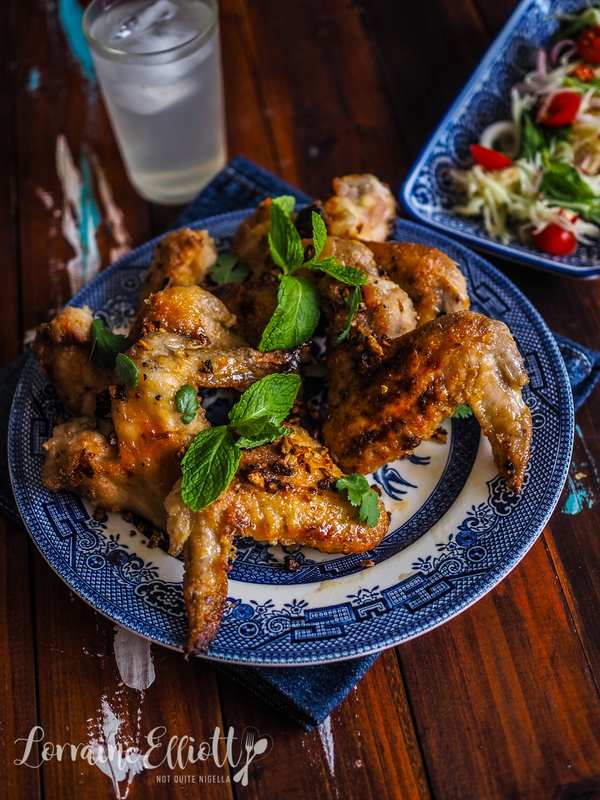 The man who invented these chicken wings was Pok Pok's original chef Ich “Ike” Truong although he is no longer at Pok Pok. And even on the blisteringly hot and rare summer afternoon lull we needed to leave our name at the counter and come back when they called and asked us to come quickly. "We can't miss these wings!" I said to Mr NQN who was busy following me carrying a mango shave ice dessert, more preoccupied with that than my current dilemma. We sat down at a table in the air conditioned confines of the dark restaurant that looked like it could have come from Thailand (or Hawaii or another such tropical location) and ordered a serve of wings. Mr NQN was getting a bit testy because of all of the food we were eating and didn't want to eat too much. I tried to quash any protests with ordering him cooling soft drinks. We were also tandem biking everywhere in an effort to burn off more calories. The wings arrived and we had already seen plate after plate of these set down at tables surrounding us. They were as ubiquitous as bowls of nuts at a bar. I took a bite-it was salty and sweet all at once with a terribly addictive crunch. Salted caramel and umami fish sauce were the first things that came to mind as we finished off the serve. And they have stuck in my mind every since. I've said many times that I don't like deep frying things, I always tend to get zapped by the oil and that really annoys me so while I did deep fry a small batch of these, I baked most of them to see the difference. Sure the deep fried versions were crispier but once they go into the caramel, the difference wasn't enough to make me want to deep fry again. I love eating deep fried food a bit too much and keeping it to food that you order while out makes it a dieting tip of sorts. I remember when some old friends of mine from many, many years ago bought a deep fryer to make chicken wings. Their idea was that they would make up a batch at the end of a long day when the summer days stretched long and they could do it in their backyard. The next time we saw them was two months after their purchase and they gained a lot of weight mostly from their love of hot wings! That pretty much has prevented me from ever buying a deep fryer and for now I'll stick with ordering it out although sometimes I wish I had a deep fryer! So tell me Dear Reader, do you have a deep fryer? Do you use it much? 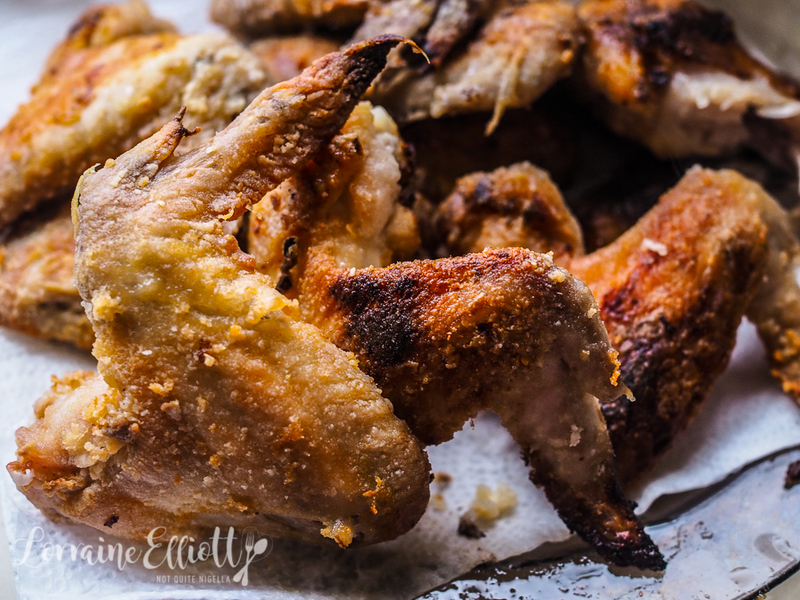 Have you ever tried these chicken wings? Step 1 - Chop the garlic cloves with the salt and soak in the hot water for 5 minutes. Strain the garlic mushing it against a sieve (you can discard the water). Mix the fish sauce and sugar and stir until sugar is dissolved. Divide the fish sauce mixture in two even portions and marinate the chicken wings in one half of the mixture with 1 teaspoon of the chopped garlic (reserve the rest). Marinate in the fridge for 4 hours or overnight. Step 2 - You can deep fry these but I prefer to bake them. Preheat oven to 200C/400F and line two trays with parchment. Drain the wings well discarding the marinade mix. Whisk the two flours together and place in a large shallow bowl. 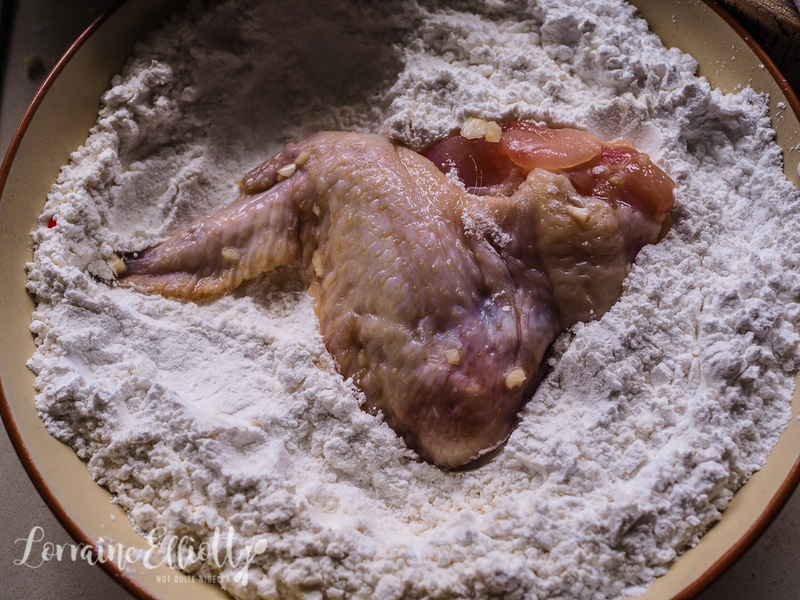 Dredge the wings in the flour and place on the tray. Spray with oil spray and bake for 20 minutes turning over once during cooking and spraying the other side with oil and adding the reserved garlic during the last 10 minutes (spray this with oil too). Step 3 - Meanwhile heat the remaining half of the marinade you reserved with 1/4 cup of water, chillies and chilli sauce and bring to a boil and reduce to about half the quantity. Dip the cooked wings in the glaze and toss for 1 minutes. Sprinkle with garlic. Serve with salad and fresh herbs. recipeSpice It Up With Kim Chi Roast Chicken and Kimcheese Potatoes! recipeBanana Flower Salad With Poached Coconut Chicken! recipeAn Authentic Pad Thai & The Pursuit of a Recipe! recipeThai Chicken & Mango Curry in 30 minutes! recipeA 5 Minute Prep Meal - Caprese Chicken Tray Bake! recipe Spice It Up With Kim Chi Roast Chicken and Kimcheese Potatoes! recipe Banana Flower Salad With Poached Coconut Chicken! recipe An Authentic Pad Thai & The Pursuit of a Recipe! 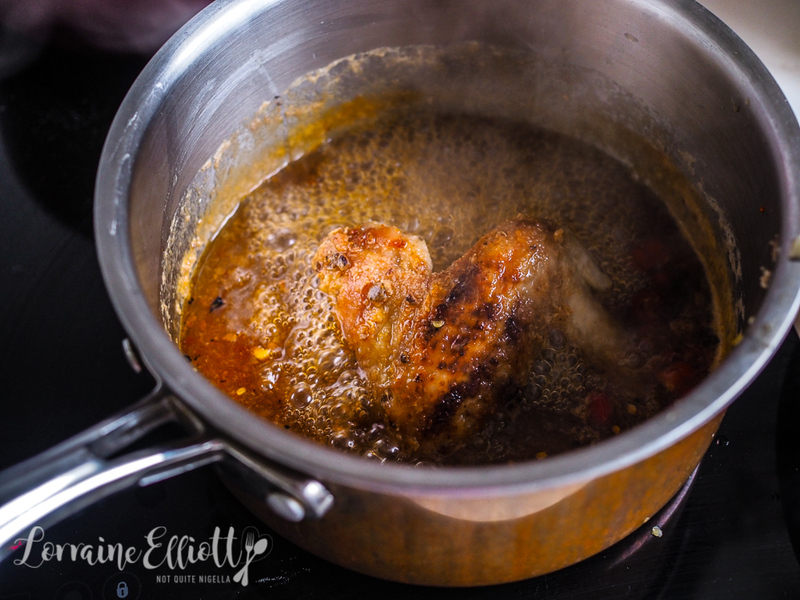 recipe Thai Chicken & Mango Curry in 30 minutes! recipe A 5 Minute Prep Meal - Caprese Chicken Tray Bake!